A yacht that truly gives you the feeling of ‘a home on the water’, Serenity II boasts an elegant interior by the London based H2 Design. Her open-plan main salon is an expansive space with impressive full beam windows and featuring a range of exotic woods and custom furniture. The perfect hub for relaxing and entertaining the main salon features a large bar, lounge seating area and a full formal dining table for enjoying exquisite meals prepared by her talented chef. 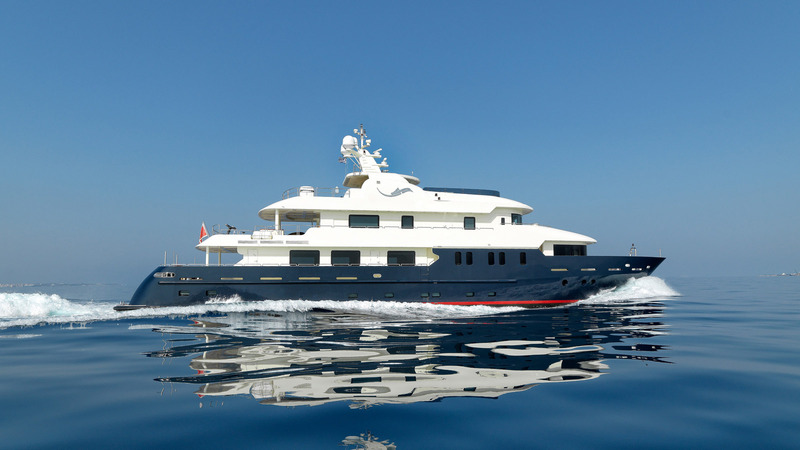 Serenity II can comfortably accommodate twelve guests in six luxurious cabins. Her sundeck, which includes an outdoor lounge area and a Jacuzzi, is always a favorite spot among guests and offers spectacular views. She also features a large selection of water toys. Serenity II has a professional crew of eight, who are always on hand to craft an unforgettable charter experience for her guests.